November 25 2017. This is a preview for a race that people care about but one for which neither prize nor medal is awarded. Because Club Cross nationals are all about team competition, there is no recognition of the Overall Winners, those who cross the finish line first. Still, the gun goes off, the race is run; somehow we care about who comes across the finish line first. It is two weeks before the race will be held in Lexington KY at the Masterson Station Park facility that hosted these Championships 5 years ago. My understanding is that the course has some rolling hills and is more challenging than the course at Tallahassee but is well within the normal range for Masters XC events.We will cover the races in the order in which they are to be run. The Preview is based on runners who have entered as of November 25, 2017 when 487 runners were already entered. Masters Men 60 and over-8Km [113 entered 11/24/17] [9:00AM]. Last year John Barbour and Brian Pilcher matched stride for stride for most of the race. Neither could gain an edge nor make a breakaway until Pilcher kicked away from Barbour once the finish line was in sight. Pilcher is nicked up this year but Barbour is not and so returns as the closest thing to a defending Champion that we have. Who will challenge Barbour for the win? It looks like the most likely candidate is Rick Becker, who matched wits and steps with Barbour in 2015 in San Francisco. Similar to last year Barbour was able to hang on for the whole race, but Becker was able to kick away to win over the last few hundred meters. The difference is that then Becker was perhaps at the height of his powers; this year he is returning from foot surgery for some nerve damage last winter. But Becker reports that the last six months he has had solid training with 60 miles per week in the last few. He ran 1:23 on a hilly half marathon course and did a solo time trial 5K in 17:48. Seems like he is ready to roar! His teammate, Joe Sheeran, who will age up from 55-59 at the end of this month, will certainly be in the mix. Sheeran finished 2nd to Pete Magill in the 55-59 division at the USATF XC Championships at Bend OR in early February. Sheeran skipped Club XC this past December but in 2015 finished 2nd to Dan King in 35:35 over 10K (5:43 pace) when Becker and Barbour were vying for the win in the 60-64 division over 8K (5:49 pace). Sheeran’s efforts include a 36:09 10K in October and a July 5K in 17:29. That 36:09 is ten seconds faster than he ran in the same race in 2015. That’s enough for me to make Sheeran the favorite at this point. Becker and Barbour will no doubt have another great duel. If either of those has an off day, a number of other runners might break onto the podium. Most likely GVH’s Mark Rybinski who ran so well at these championships when they were in San Francisco in 2015, is still nicked up. But Ken Youngers is running well and has a bronze medal from the 5K at Syracuse and a silver medal from the Masters 5km XC Championships in Boston. Reno Stirrat has been just a bit further back with a 4th at Boston and a 6th at Syracuse. Should Charlie Andrews or Tom Dever enter between now and December 9th, they could also make things interesting. 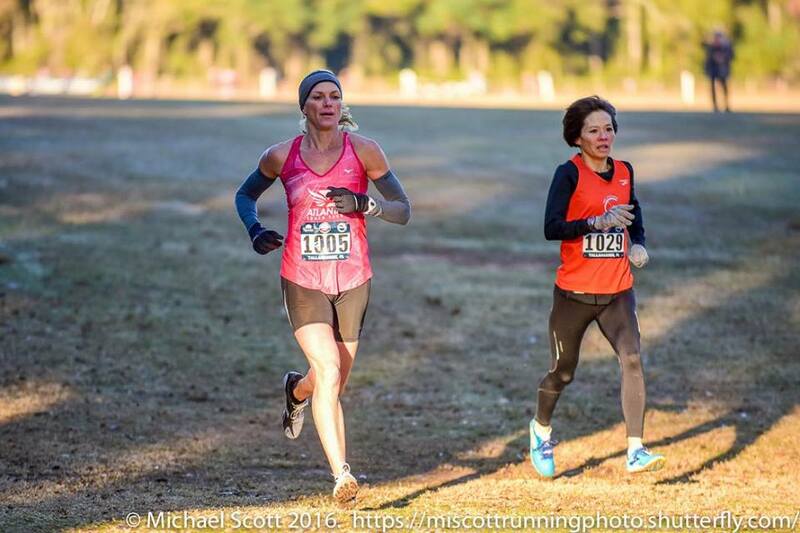 Masters Women-6Km [111 entered 11/24/17] [10:00AM]. The top two finishers from last year are both entered. Last year in Tallahassee Sonja Friend-Uhl and Janet McDevitt matched paces for most of the race. With 2 kilometers to go, McDevitt pushed the pace and tried to break away but Friend-Uhl held strong and closed up again. With 1500 meters to go, McDevitt tried again, but with the same result. Over the last kilometer, Friend-Uhl finally mae a strong move and pulled awy steadily to register a solid win with a 22 second margin. Masters Men 40-59. It looks like Kevin Castille, the two-time defending champion will pass up the Club XC Championships. It was recently announced that he was added to the field of the USATF (Open) Marathon Championships, hosted by the California International Marathon on December 3rd. Both Greg Mitchell and John Gardiner who finished 2-3 last year are entered. This will be Mitchell’s first national championship race since finishing 5th at the USATF XC Championships in Bend OR. Mitchell was probably not at the top of his game for that event; even though he was able to break 25 minutes at a 5 mile run on St. Patrick’s Day weekend, he shut things down shortly afterward to take a break to heal up. He does not appear to be race tested but Athlinks does not pick up all races so that may not be accurate. It is hard to imagine Mitchell making the trip to Lexington KY without having the fitness to contend with Gardiner and David Angell. 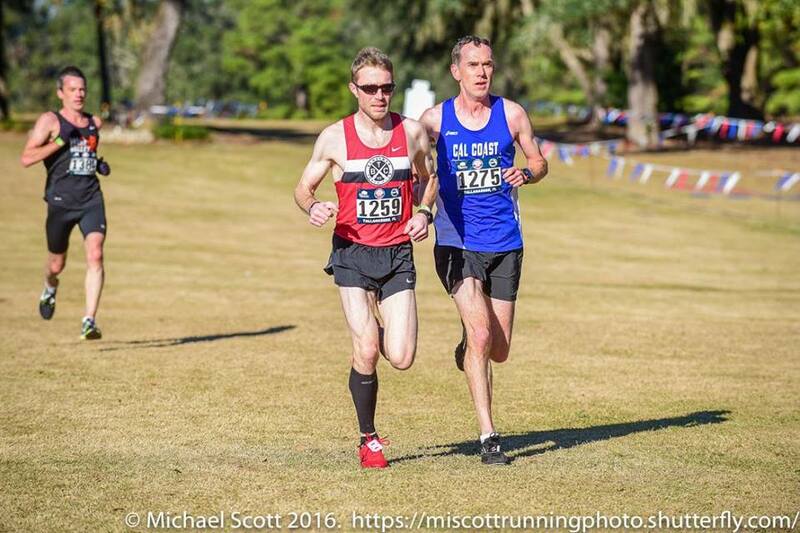 Greg Mitchell (1259) and John Gardiner (1275) work to establish a gap on Neville Davey at Club XC in Tallahassee last year. 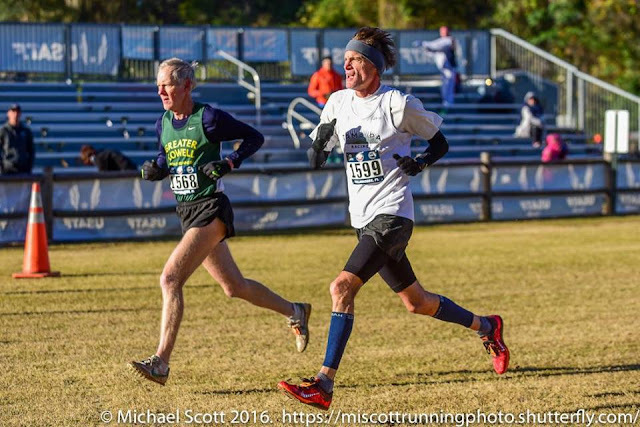 Angell did not contest Club XC last December but he finished 4th at the USATF XC Championships in Bend in February and 2nd to the BAA’s Aaron Price last month at the Masters 5km Championships in Boston. Price will try to improve on his 20th place last year at Club XC in Tallahassee; he won the contest with Angell in Boston for the 5km XC crown. Home course advantage may have played a small part but it seems likely that Price is simply sharper this year and will contend. On the other hand, Ryan McCalmon who finished 11th last year, beat Price by a few seconds in early November at the USATF-NE 8K XC Championships. The more challenging 10K course may favor McCalmon and others over Price. Neville Davey, who finished 4th last year will be back looking to step up a notch. He ran 1:09:04 at the San Jose RnR HM last month. [Late update-Running in the Elite Pacific Association Field at the Silicon Valley Turkey Trot, Davey finished 21st of 46 in a smoking fast 14:44. That is almost 20 seconds faster than his 2015 time when he later finished third in Club XC at San Francisco, 11 seconds behind Greg Mitchell who took 2nd. That bodes well for Davey although he will certainly have no home course advantage.] Alan Jackson who finished 2nd to Greg Mitchell in Bethlehem and 11th in San Francisco is back after a year’s hiatus. With a recent 32:11 6 miler, Jackson appears to be fit and he is one of those runners who seems to thrive on a tough XC course. John Howell who finished 2nd at Bend (ahead of Gardiner) and 6th at Tallahassee cannot be ignored. Other sin the hunt include: Frankie Adkins who finished 24th last year but had a nifty 3rd place in the 10K Masters Championship in Dedham in April; David Wertz who finished 9th last year and has a 32:04 10K in April; and Jonathan Frieder who had an off day last year in Tallahassee but had a superb 15:49 to take 5th in the Masters 5K Championships in Syracuse this October. I think you missed that Kris Passo is entered in the women's race. I think she has a good chance to win. Yep, maybe she hadn't entered when I wrote this. Check out the 12-17-2017 update.